As a small companion piece to Brian McLaren And His New Emerging Progressive Theology here at Apprising Ministries I now point you to today’s Jesus, Reconsidered: Book Sparks Evangelical Debate by Barbara Bradley Hagerty religion correspondent for NPR. 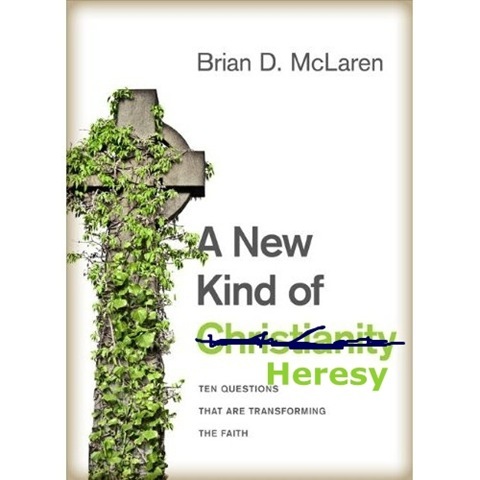 In my coverage of heretical Emerging Church guru Brian McLaren, I’ve told you that he’s really becoming the source of much obfuscation of the genuine Gospel of Jesus Christ within the broader visible church; as he, in my mind deceitfully, continues using the media to pass himself off as an evangelical—as in this short NPR broadcast. It turns out that McLaren is considered one of the country’s most influential evangelicals, and his new book, A New Kind of Christianity, takes aim at some core doctrinal beliefs. McLaren is rethinking Jesus’ mission on Earth, and even the purpose of the crucifixion. Please understand this is not about Barbara Hagerty, I personally wouldn’t necessarily expect her to be an expert in evangelicalism; that said, McLaren isn’t “rethinking” in any meaningful the sense. He’s not going to try and come to a deeper understanding of the non-negotiable evangelical Protestant doctrine of the penal substitutionof Jesus Christ on the cross for our sins; you see, McLaren et al have already outrightly rejected it. In addition to his affinity for the liberal theological version of the cross, that God is merely entering into human suffering, let’s take a moment to consider a conference McLaren’s involved with next month. As I said before, if “the lens of non-dual thinking, a new politics and a new theology rooted in the ‘third way’” sounds even remotely evangelical to you then you really do need to have your spiritual head examined. And I’ve been laboring to alert you that this “new theology” refers to the new version of progressive/liberal theology—Liberalism 2.0—which McLaren begins to lay out systematically in ANKoC, and which progressive/process theologian Philip Clayton, along with his Transforming Theology project, are in the process of constructing along with the top progressive theologians and seminary heads, etc. Earlier in Philip Clayton And His Transforming Theology I showed you that this Liberalism 2.0, which they also refer to as “big tent” Christianity, is so large that it hopes to bring in actual evangelicals like Al Mohler, liberals like Living Spiritual Teacher Dr. Marcus Borg who deny the Deity of Jesus Christ, and even non-Christian cults like Unitarian Universalists who, in addition to rejecting the Deity of Christ, also deny the triune nature of God i.e. Who He is. Barring the Lord allowing some huge kind of spiritual deception to fall I think the rational person should be able to see that it’s an impossible task. That’s absolutely right, says McLaren. Consider the core evangelical belief that only Christians are going to heaven and everyone else is doomed. That may have rung true for his grandparents’ generation, he says, but not now. Indeed, just as they have been all along; my point is McLaren makes it appear that Christians being exposed to the “other” is something new. What is new is the approach which the neo-liberal Emergent Church takes toward people in other religions by not engaging them with “the core evangelical belief” that those who are not in Christ remain condemned and under the wrath of God. This is why the Gospel of repentance and the forgiveness of sins, which was won by Jesus Christ in His finished work on the Cross and His triumphant rise from the dead for our justification, is such incredibly Good News. There, in the last sentence, is why this new liberalism of Emergence Christianity pushed by the Emerging Church is ultimately doomed to failure: “But if McLaren and surveys of young people are any guide, there seems to be an appetite for a different sort of evangelical Christianity.” God’s Law, and His Gospel stand, whether a given culture of emerging McLarenites and/or young people have “an appetite” for it, or not. I sure do wish that there hadn’t been “spiritual knuckleheads” misusing Christianity, for whatever reason they have had; but, this will never change the fact that no matter what so-called postmoderns think, there are not “Christianities”; there always has been only Christianity. You can download and listen to this engaging piece by NPR’s Barbara Bradley Hagerty right here. 1. Walter Martin, (circa 1985) The Cult of Liberalism, CD Rom, available from Walter Martin Religious InfoNet.